POS for Webshops is released! Re: POS for Webshops is released! You used to have a demo of front end and backend - what has happened to it? We want to update all the new features on our demo. We hope to get our new demo up-and-running within the next 2 weeks. But it is possible to use our satisfaction guarantee this way you can try the POS without any risk. We have a 14 day’s Satisfaction Guarantee on our software, no questions asked (but we do appreciate to get some feedback). Just send us an email with the refund question within 2 weeks after you bought the POS for Webshops software and we will give you a full refund within a few days. There are also some nice new features that you can try in our demo. We have released our new Orderpick feature. 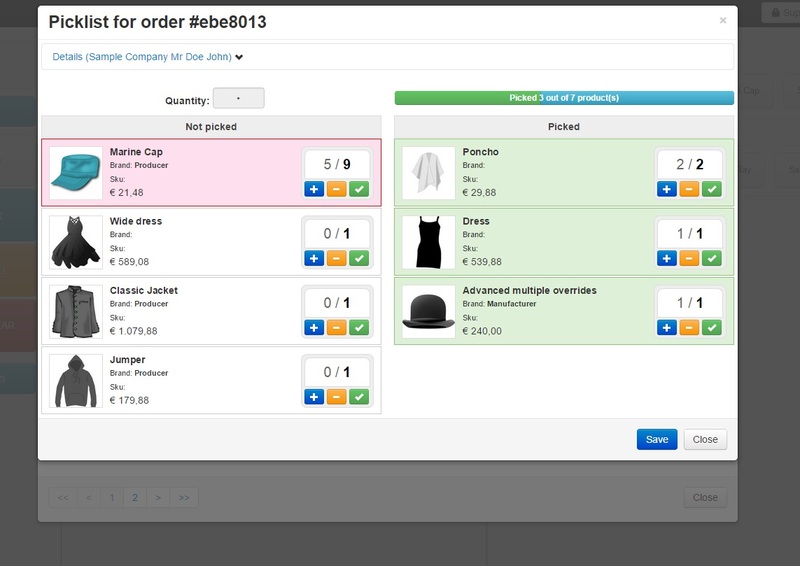 With this feature it is possible to open orders from the webshop and pick the orderitems from the store or wharehouse. Yes it is possible to print the receipt immediately. The POS uses the ESC-POS commands to communicate directly with the receipt printer. When using the POS on a live site you will need to use the pop-up first, but when installed on a local pc or laptop the POS will print the receipt immediately after choosing a payment method. I have looked at your demo before but was never really prepared to make the move to a POS system until now. 1. Can POS for webshops be run from a tablet like other POS solutions? 2. I have a lot of products in my shop that will not be present in the webshop how is that handled? 3. I was looking for a forum at your site as it's usually a good indicator as to how much trouble people have and how well support is. I cannot find any user impressions of your software. Any users of the system who'd like to comment on how well this works and if there is features they miss. 1) Yes it is possible to use the POS from a tablet. I've done so with a windows tablet with a usb barcode reader. 2) You have 2 options: a) add those products to your website but deactivate them. They still will be recognized by the POS. 4) I didn't test this printer, but it shouldn't have any problems. We have tested other Star / Epson / Other printers without any problems. Maybe it's good to know that (when installed on a local machine with a local server) the POS will use the ESC/POS commands of the printer. How much do you test your component with beta and RCs of new VirtueMart releases ? I see that a feature like 'discontinued' now in 3.0.19.x could make sense for articles that won't be renewed when stock is down to 0, and I would be interested in using new VirtueMart version once it's released for production... Would the current release of POSforWebshops support newer releases, or if you see any incompatibility in testing will you warn your client base? I'd be interested in renewing my subscription but I know you've had some reorganisation going on that has caused reactivity to tickets submitted to take a hit. Put bluntly I don't want to renew if no new releases come. I don't intend to sound harsh or critical, and I am very pleased with the component so far... Just thinking of the future and wondering how things are unfolding for your team. At the moment we are rebuilding our website. we had some issues with the current one. We hope to finish the website in the second half of next week. Since the POS is build to work on a local server as well, changes in the ecommerce component won't break the POS. In case of a major change in the ecommerce component we need to change the connector in order to use the correct fields for synchronizing. We try to keep up with the changes that are done in Virtuemart. We are building a complete new version of the POS. I hope we will have a first release in the next few months. Our customers with an active POS subscription will have the first option to test this. Option to put a cart on hold is provided. the cashier can simply search for products by name/SKU. the cashier can simply search for a customer by phone number and also can add a new customer. do you have any news on the new version/rewrite ? We're stuck with PHP 7.0 as the dependency with mcrypt causes an upgrade to PHP 7.2 to fail.